For most people, the US suffrage campaign is encapsulated in images of orators such as the tightly coifed Susan B. Anthony, the wimpled Elizabeth Cady Stanton, and others who hectored for women's rights throughout the nineteenth century. The campaign to secure the vote for US women, however, was also a modern and print-cultural phenomenon, waged with humor, style, and creativity. In this fascinating cultural history, Mary Chapman demonstrates the importance of the aesthetically innovative print culture produced by US suffragists in the two decades leading up to the passage of the 19th Amendment, seven decades after women's rights activists first met at Seneca Falls. A century before the advent of "social media", suffragists mobilized the masses [fashioned a "suffragist spring" through creative forms of propaganda including advocacy journals, guest-edited mainstream magazines, banners, voiceless speech placards, publicity stunts, poetry, and fiction. These propaganda forms made the public sphere much more inclusive even as they also perpetuated an image of the suffragist New Woman as native-born, white, and middle-class. 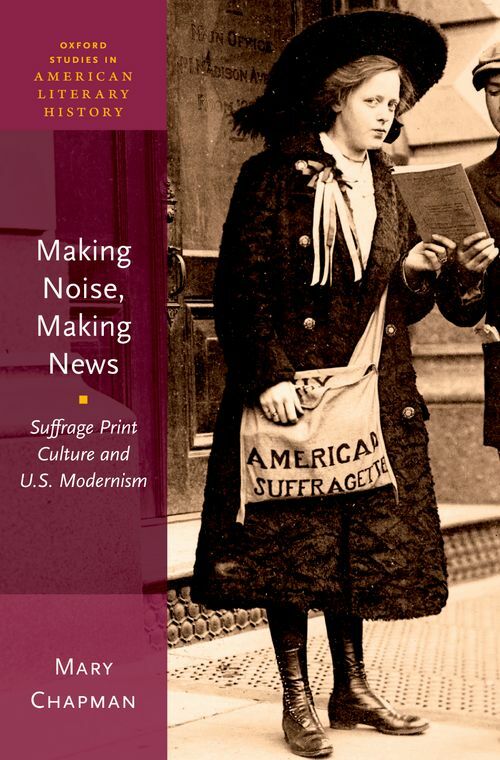 Making Noise, Making News also understands modern suffragist print culture as a demonstrable link between the Progressive Era's political campaign for a voice in the public sphere and Modernism's aesthetic efforts to re-imagine literary voice. Chapman charts a relationship between modern suffragist print cultural "noise" and what literary modernists understood by "making it new! ", asserting that the experimental tactics of US suffrage print culture contributed to, and even anticipated, the formal innovations of US literary modernism. Drawing on little-known archives and featuring over twenty visually stunning illustrations, Making Noise, Making News provides startling documentation of Marianne Moore's closeted career as a suffrage propagandist, the persuasive effects of Algonquin Table's Alice Duer Miller's popular poetry column, Asian-American author Sui Sin Far's challenge to the racism and classism of modern suffragism, and Gertrude Stein's midcentury recognition of intersections between suffrage discourse and literary modernism. "Magpie Habit": Quotation and Ventriloquism in Alice Duer Miller's Are Women People? Mary Chapman is Associate Professor of English at the University of British Columbia. She is the coeditor of Treacherous Texts: U.S. Suffrage Literature 1846-1946 (Rutgers UP, 2011).